Enjoy the beauty of the most fashionable of the Italian islands with your wedding in Capri. The wonderful scenery, the unparalleled service, and the incredible weather will be the most beautiful frame for your “I do”. The Island of Capri is one of the most picturesque and visited locations in Italy. Its unique beauties were celebrated in ancient times and later published for the world in Homer’s works: Ulysses sailing past Capri island narrowly escaped the fate of those who hear the voices of the enchanting Sirens. The island still has a mythical charm: tiny alleys, small bays, and the wonderful Blue Grotto (“Grotta Azzurra”). Small openings in the back of the cave let the daylight in, reflecting on the limestone floor and walls, creating a fantastical and magical atmosphere. Inside the Grotto, a magical turquoise light welcomes visitors from all over the world. Even if it is not possible to get married into the Grotto, many beaches and bay are stunning wedding locations in the area. I will be glad to tell you more in person and start planning your wedding in Capri! 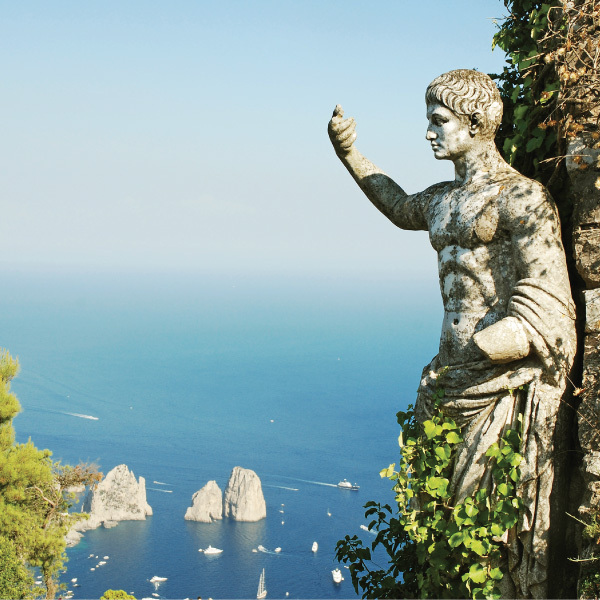 The breathtaking landscapes and the beauty of Capri stretch from the rocky caves around the island to the edge of the horizon and have been an inspiration to poets, lovers and travelers throughout the centuries. I cannot imagine a better location for your beach wedding in Italy. If you are planning a wedding in Capri, you will find this beautiful island is pretty easy to reach. You and your guests can fly to either Naples or Sorrento; then you will have a 60-minute ferry crossing to reach Capri. There are two main towns in Capri: Capri Town and Anacapri. Capri Town is the busiest and probably best known of the island’s towns. Here the vibe is lively and glamorous so if you love the idea of a romantic, vibrant and classy wedding then Capri Town is the perfect destination for you. Let me spoil you with the choice of gorgeous wedding venues that have unbeatable views. I have selected the best villas, luxury hotels, and wedding venues in Capri, to be able to accommodate every request. The second largest town on the Capri Island is Anacapri. Anacapri is a much more tranquil location than Capri Town. This little town has an unspoilt local feeling and will be the perfect location for your Capri wedding if you are looking for something with a charming and quiet vibe. Anacapri is the ideal destination if you are really looking to embrace traditional Italian culture into your wedding and if you value privacy and a bespoke service. In Anacapri, there are some of the most beautiful hotels and villas of the Island. Therefore, many international superstars and VIP come to Anacapri to get married or spend their holidays. Luxury services are the standard in Anacapri and the most authentic Italian style is enjoyable everywhere in this little town. Let’s not forget that Capri and Anacapri are wonderful wedding destination as well as preferred holiday destinations in Italy. A wedding in Capri is a great idea if you want to have your family and friends enjoy some unforgettable days on the Italian Islands.